Labour’s former leader-in-waiting is now officially in charge. She’s asking the Irish people to have trust in her, and in the party as a whole. SOCIAL PROTECTION MINISTER Joan Burton has been named as leader of the Labour party, following the announcement of the final results in Dublin’s Mansion House this afternoon. It follows a five-week campaign, with Burton winning 77.5 per cent of the vote in a landslide victory over Alex White, the junior health minister, who was the only other contender for the top job. Four TDs are vying to become the party’s deputy leader — with the results of that vote set to be announced later this evening – but already there are indications that junior minister Alan Kelly will win that contest. Burton’s election comes as no great surprise — the Dublin West TD has been seen as the front-runner and leader-in-waiting ever since Eamon Gilmore announced he’d be quitting in the wake of a disastrous showing by the party in last month’s local and European elections. She’s expected to be confirmed as the country’s 23rd Tánaiste later this afternoon, after Gilmore officially stepped down earlier, and will be just the third woman to hold the position, after Mary Harney and Mary Coughlan. Following this afternoon’s announcement, made in the Round Room of the Mansion House just before 4pm, Gilmore said he was proud that Labour had elected its first woman leader. “The job you are undertaking is a difficult one – I know,” he told Burton, who in turn thanked the former leader for “the incredible journey” he’d led Labour on. 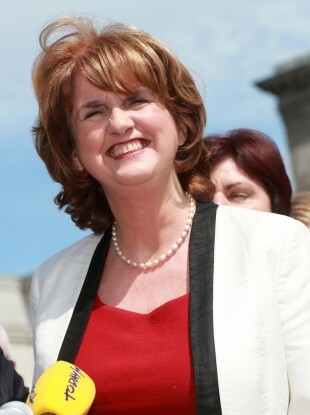 In her speech, Burton said her job was to ask the Irish people to have trust in her as Labour leader, and in the party as a whole, and that she would have a relentless focus in Government on getting people and businesses back to work. She said the hustings — held in various locations around the country over the last month —– had been a great exercise in democracy. Let’s go on to the next stage of the journey — and let’s win. She is tenacious, she is a fighter. Speaking ahead of this afternoon’s announcement, Burton insisted she had made no decisions as yet about a reshuffle of Labour ministers, but that she expected to meet the Taoiseach after the weekend to discuss it. White wouldn’t be drawn on whether he was expecting a promotion to the front bench, saying only “this is Joan’s day”. Burton is expected to hold preliminary talks with Enda Kenny by phone this evening. In total 2,720 Labour members cast their vote in a postal ballot with 19 votes spoiled, giving a total valid poll of 2,701 and a quota 1,351. Burton took 2,094 votes while the defeated White took 607. A former accountant, Burton trained with PriceWaterhouse in Dublin prior to becoming a senior lecturer in DIT. She was first elected to the Dáil in 1992, and served as a junior minister in the Department of Social Welfare in the Fianna Fáil-Labour coalition, later moving to become junior minister with responsibility for overseas aid in the mid-1990s Rainbow Coalition. Burton lost her seat in the 1997 General Election, but was elected again in 2002 and has remained a TD ever since — taking over in Social Protection in the wake of the last General Election. She’s married to Pat Carroll, a Senior Lecturer in Mathematics at DIT Bolton St. They have one daughter Aoife, who now works as a barrister in Dublin. Email “Joan Burton is the new leader of the Labour Party”. Feedback on “Joan Burton is the new leader of the Labour Party”.